Likeable, if predictable comedy, enlivened by strong comic performances from Rainn Wilson and a talented supporting cast. 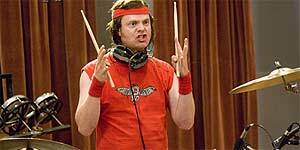 Rainn Wilson stars as Robert 'Fish' Fishman, an ex-drummer for lycra-clad rock group Vesuvius, who was kicked out of the band just as they were about to hit the big time. Two decades later, Fish is depressed when he learns that Vesuvius are about to be inducted into the Rock and Roll Hall of Fame, but his spirits are lifted when his sweet-natured nephew Matt (Josh Gad) asks him to be the drummer for his garage band, alongside fellow band members Amelia (Emma Stone) and Curtis (Teddy Geiger). When an embarrassing YouTube video gains the band a cult audience, Fish sees his chance for a second shot at the big time and soon he's taking the band on the road, much to the concern of Curtis' mother (Christina Applegate). And when a smarmy record exec (Jason Sudeikis) shows an interest, the stage is soon set for the inevitable confrontation with Vesuvius. It's a testament to the comic genius of his performance on the American version of The Office that Rainn Wilson has graduated to big-screen comedies, playing parts that would normally go to Jack Black or Will Ferrell. Indeed, elements of Wilson's performance are directly lifted from Black's role in School of Rock, though that's not necessarily a bad thing. The script has several good gags and the characters are extremely likeable, especially Emma Stone, who's rapidly turning into Hollywood's go-to girl for adorable geeks. Similarly, Jason Sudeikis steals every scene he's in as the smarmy exec, while Will Arnett is reliably hilarious as Fish's ex-bandmate. Wilson's brand of weird intensity is very funny, but it doesn't lend itself to romantic chemistry, meaning that Applegate's potential love interest role is essentially side-lined. Similarly, the ending could have used a bit of fine-tuning in the emotional pay-off department. The Rocker is a likeable comedy that delivers several good laughs and is worth seeing for its comic performances.